The violent history of the Earth's Moon just gave rise to a new mystery. At a Royal Society special meeting today, planetary scientist Rick Carlson announced that the Moon is a few hundred million years younger than we thought. This could change our understanding of how the Earth formed, too. Carlson reported that new methods for dating rocks from the Moon's crust or regolith have placed its birth between 4.4 and 4.45 billion years ago. Previously, scientists placed its origin at 4.56 billion years ago. 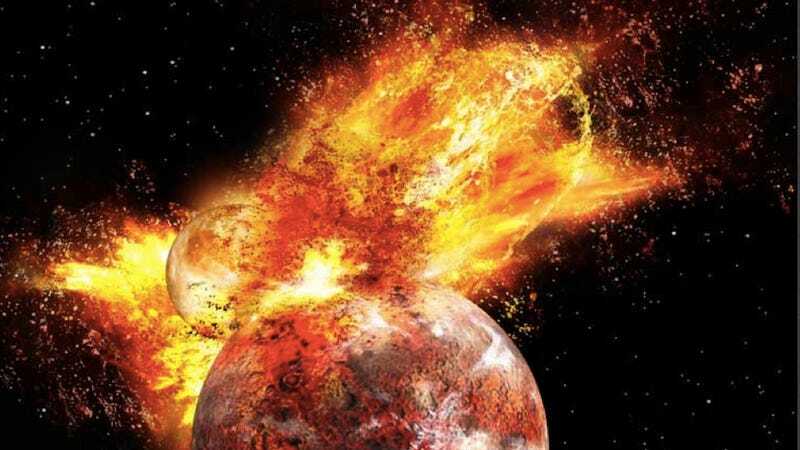 The Moon was formed when a Mars-sized body smashed into the Earth, reducing part of our planet to liquid rock and shooting debris into orbit that slowly cooled and coalesced into the Moon. In a release about Carlson's work, the Royal Society explains that the Earth was likely formed from many such smashups before the Moon came along. Like all the planets, the Earth was born in a swirling disc of dust and gas enveloping our young Sun. That disc coalesced into chunks pretty quickly, which zoomed around the Sun smashing into each other for a while. Why did all the planet-forming dust around this star disappear in only three years? Current models for planet formation assemble dust in the planetary nebula pretty quickly - where "pretty quickly" means a couple of million years. When assembled at this rate, the energy from violent collisions between planetesimals (small celestial bodies thought to fuse and form planets) and the heating caused by decay of radioactive elements causes even small planetesimals to undergo large-scale or complete melting. Through this melting process, iron metal segregates to the centre of the planetesimal and most of the volatile elements move to the atmosphere. When this chemical differentiation occurs on a small planetesimal, the planetesimal does not have enough gravity to hold on to its atmosphere, so it escapes into space. Earth is very depleted in volatile elements compared to the average composition of the Solar System, likely because it formed from differentiated planetesimals that had already lost their atmospheres. Most of these big rocks lacked enough gravity to hold on to much of their atmospheres. And Earth lacks a lot of the volatile elements like hydrogen and methane we see on other planets. So this lack of volatiles in our atmosphere could suggest an origin story for Earth where a bunch of differentiated (i.e., melted) rocks with very little atmosphere smashed into each other and formed the Earth. Then, a few hundred million years later, one big rock was late to the party. It smashed into the already-formed Earth, melted it a little, and then formed the Moon. If you asked the question ‘How old is the asteroid Vesta?’ the answer would be 4.565 ± 0.001 billion years. Scientists can state this so precisely because the global melting of the asteroid Vesta, as sampled by a group of meteorites known as eucrites, happened so quickly that the age was frozen in precisely in the rocks formed during this event. Furthermore, no later significant geologic events happened to disturb the age recorded by the rocks because Vesta is too small to retain enough interior heat to allow further melting/volcanism. However, ask the same question of the Earth or Moon and you don’t get a very precise answer. Earth likely took longer to grow to full size compared to a small asteroid like Vesta and every step in its growth tends to erase, or at least cloud, the memory of earlier events. The most precisely determined age for the type of lunar crustal rock that is believed to form directly from the magma ocean that occurred during Moon formation is 4.360 ± 0.003 billion years. Over the last decade or so, two areas have been found on Earth that have crustal rocks/minerals with ages approaching this date. The first is an area where a few zircon grains were found in much younger sediment in Western Australia. The other is a group of rocks found along the shores of Hudson's Bay in Canada (the Nuvvuagittuq terrane). Other regions of very old Earth rocks (Isua Greenland, and the Acasta rocks in central Canada) are also beginning to show evidence of a major differentiation event on Earth around 4.45 billion years ago, so the possibility exists that we are now seeing the first crusts formed on both Earth and Moon after the giant impact. OK, that is just plain awesome. Scientists have discovered rocks on Earth that show signs of a massive rock-melting event, roughly around the time we now believe the Moon formed. Could these be the traces of that "big splat" that formed the Moon? The point is, you can visit some of the rocky crust that formed on Earth in the wake of the catastrophic event that created the Moon — if you're willing to hike up to the shores of the Hudson Bay. Carlson says our new understanding of Earth's age and formation also leaves some intriguing questions open. For one thing, it seems like the Earth may have been pretty well formed before the impact that formed the Moon. If that's the case, he wonders, "Would the impact have blown off the primordial atmosphere that formed from this earlier epoch of Earth history?" In other words, did the birth of the Moon destroy the first atmosphere on Earth? If that's true, it would be the planet's first experience of catastrophic climate change. You can follow the events of the Royal Society's two-day meeting about the Moon's origins on their website. All images except the one showing a planet-forming nebula by Ron Miller. Annalee Newitz is the author of Scatter, Adapt and Remember: How Humans Will Survive a Mass Extinction. Follow her on Twitter.